Film budgets can be daunting. Any good filmmaker knows what it takes to get her film made, and knows how to put together a simple budget for their project, but most new filmmakers aren’t intimately familiar with the vast amount of categories and line items found in a typical professional line-item film budget. What’s a line item in a budget? In simple terms, a film budget is a shopping list, and a line item is just an item on that list. But line items, in a larger sense, are really where the rubber hits the road. Making movies on a professional level, whether its a large film or a small film, requires an attention to detail that most new filmmakers can find either extremely intimidating, or overly complicated, or both. This series of articles will seek to shed light each of the typical line items found in a typical professional film budget, using plain, simple English language to explain what each line item is for, when it’s needed, and why it’s needed. For clarity’s sake, let me first explain what the difference is between above the line and below the line, and why the word “line” in those phrases shouldn’t be confused with the concept of the “line item” term we use to describe each specific cost listed in a movie budget. In any film budget, there’s the topsheet, followed by the line items of each category. Typically, a budget will start out with the “Above The Line” expenses. Typically, above-the-line refers to producers, directors, writers, cast (including name actors/movie stars, etc. ), and stunt cast/personnel. So “Above the Line expenses” would refer to all of those positions, expenses, and personnel. “Below the line” then refers to everything and everybody and every expense that isn’t considered Above the Line. More simply, imagine a line drawn in on a budget page. Above that line are your film’s producers, directors, writers, cast, etc. e.g. all the things and people that typically get paid more than everybody else due to their position, talent, fame, or uniqueness and/or value they represent to the film’s success or getting it funded or distributed. With most pro film budgets, you’ll find that the budget has a topsheet. The topsheet is simply a summation of all the line items in all the various categories throughout the entire budget. Topsheets have what could be considered “line items,” but those line items are really just totals, drawn from the actual categories and line items from the overall budget itself. We’ll break down each of these topsheet line items into more detail later, as each of them represent an entire category in your film budget, and that category can contain many, many different line items for various personnel, equipment, services, and other expenses. This is the line item for producer salaries, producer fees, and/or fees paid to studios or production companies for their services. Note, no fringes are listed here, typically, as those are relegated to the Above-The-Line Fringes line item. Salaries and/or fees for your main cast. Typically, movie stars or name actors fill this category, and this category may contain their per diems, travel, and other expenses, even though that information could alternatively be listed in the specific A-T-L travel (Above-The-Line Travel) line item. These are your day players, weekly players, or cast members who simply aren’t the big stars or the ones featured as much as the principal cast. They very much could be name actors, but they’re typically distinguished from the “stars” or “leads” on the film for a variety of reason, both political and financial. Stunt personnel are considered cast, and are paid and treated as such, with many of the same perks, benefits, and drawbacks that the non-stunt cast is paid. Stuntpeople, however, do get paid a different SAG rate. It’s similar to the non-stunt SAG rate, but is usually a bit higher due to the dangerous scenes they’re asked to shoot. This line item also includes their material and prep costs, as well as additional crew, etc. This line item on the topsheet represents the total spent on everybody’s living and travel expenses, but for Above-the-Line personnel only. As we’ll see when we break these categories down in a later article, the line items within this category range from plane travel to hotels to car service to car rentals, food, per diems, and a few more key ingredients required to keep the above-the-line (A-T-L) personnel housed, fed, and doing their jobs properly. “Fringes” are everything you never read on your paycheck: Taxes taken out, labor union dues, medical, social security, payroll fees, etc. This topsheet line item sums up all of those fringes, paid to the A-T-L personnel only. And now we get to the BELOW-THE-LINE topsheet line items, so I’ve gone ahead and drawn a line where the Above-The-Line ends and the Below-The-Line begins, so you can more readily visualize what I’m talking about. Production staff includes your UPM, 1st AD, 2nd AD, Production Coordinators, etc. all the way down to your Production Assistants. And it includes the production office and expenses such as copies, courier services, radios – all the things the production department needs to do its job. This is the topsheet line item for extras or stand-ins and all the expenses they might incur, such as agency fees, travel, costuming, casting, etc. Depending on the size of the film, they could be SAG extras, or they could be non-union. This is the line item for the camera department, and it includes the DP, assistant camera personnel, the camera package itself, expendables, and lots more. Flags, silks, c-stands, apple boxes – all the equipment that’s not a light or a light stand. This is what the grip crew is responsible for. Trucks to carry the grip gear, personnel, dollies, you name it. If it lights up or plugs in, the electrics are in charge of it. Lights, globes, stands, generators, cables, as well as trucks and personnel. The sound recordist(s) and their boom operators (mic operators) as well as their gear and expendables. Picture cars (e.g. police vehicles, tanks, classic cars, or even contemporary cars). The transpo department is typically responsible for all the trucks and vehicles on a picture. As visual effects have exploded in the last 20 years, it’s important to distinguish between computer visual effects and standard, old-school practical effects. Those are what the Special Mechanical FX department is in charge of. Explosions, gunfire, bullet hits, etc. They usually work in tandem with the visual effects department (VFX) and stunts. Skilled laborers (or unskilled, depending on your budget level), construction expenses, hauling, materials purchasing, as well as striking expenses (taking everything down). Working close with the Production Designer or Art Director to make sure each set adheres to the Production Designer’s vision. This could include rentals of furniture, rugs, lamps, or mad scientist laboratory devices, or totally original fabrications (which would typically fall within a separate special department within the art department that specializes in fabrication). Also typically falling within the purview of the art department, the property department is responsible for all props. Purchases, rentals, crew, and other expenses. This line item consists of the wardrobe crew (typically a Wardrobe Designer or Key Costumer), support crew, rentals of costumes, creation of costumes, and/or purchasing costumes, as well as maintenance, cleaning, and repair. Day-to-day makeup and hair for the cast, which could range from exotic to simple. This line item includes makeup purchases or “kit rentals” (typically the Key Makeup person rents their makeup kit to the production. 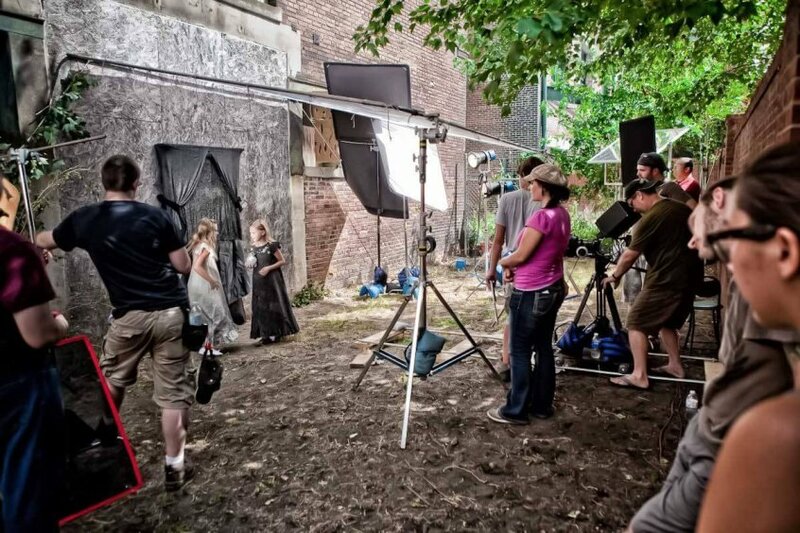 Location rentals, porta-potties, catering, permits, police and fire personnel – this line item covers the expenses of a film company’s day-to-day operations and logistics, whether it’s on set in a studio for 90 days or on location for 18. This line item comprises the costs of animal actors and their handlers, specific training, lodging, feeding, care, etc. A film’s second unit is typically a small group comprised of a 2nd-unit director, a 2nd-unit DP, and several other crew members who typically work separately from the main unit, in order to film stunts, special location shots, B-roll, or work tandem with the main unit on large, special set piece events that require a multitude of cameras and crews in order to capture well. Remember what I said about fringes (above)? Well, these are the fringes for everybody and everything below the line. This topsheet line item sums up the fees and/or salaries for your editors(s), post house, colorists, etc. as well as any rentals for editing equipment or space, and any purchases required such as drive space, etc. This line item is for your composer, or your sound supervisor, or both. Needledrops (aka song placements), original score, recording studio fees, musician hires, etc. Your post-production sound package (or your small film’s sound personnel’s) fees and expenses, such as ADR, sound editing, sound mixing, mastering, timing, delivery, etc. This is the line item that comprises all the costs of your CGI, whether you’re doing it at ILM or hiring a small team of professionals. Yep, the post people have these too. A PR firm, or marketing costs. E&O, general liability, etc. All policies your film requires are budgeted under this line item. This line item is typically set at 10%. That is, it’s a built-in assumption that your budget is going to go at least 10% over. It might be needless to say, but some films go over by a lot more than that, and some come way under. We’ll dive into each of these topsheet line items with more depth in our next series of articles. Any chance you could make a budget for something being produced in the UK ?